First, let me say that I'm not a morning person. 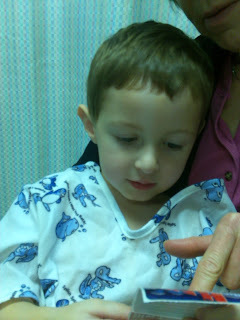 Caleb's surgery time had a 6:45 a.m. arrival required. Did you catch that? 6:45. In the morning. In a city an hour and a half away. Right now caffeine and adrenalin are carrying me... oh, and that enormous thing called the grace of God. After arrival, Caleb was so chilled. He played a couple rounds of Go Fish (with Thomas cards, of course) with Grandma Joan. 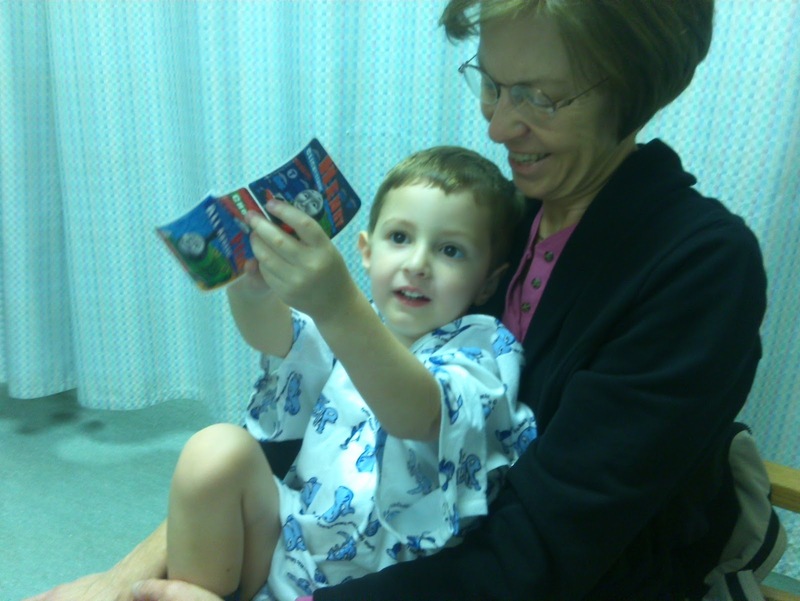 Then during the pre-op chat with the nurse, she gave him three Thomas stickers! What?!?! They have Thomas stickers? Suddenly his world got a lot better. After a half hour of waiting, my mom and I were taken back to recovery. My sweet baby boy was calling for his mom. They immediately put him in my arms, and we cuddled for an hour. Ah, a whole hour of cuddling with my eldest. Wonderful. The recovery nurse also worked her magic with even more Thomas stickers and a Thomas movie to pass the hour. We were in and out of the hospital in three hours! Unbelievable! It was only 9:15 a.m.! A whole day in front of me. Oh my. A whole day in front of me?!? On top of Caleb having the best time possible, we heard wonderful recommendations for our surgeon before we went to the hospital and then heard great things about our anesthesiologist after arriving at the hospital. And so far, Caleb has had NO side effects from the surgery or the anesthetic. So. so. grateful. So thank you. Thank you to all who prayed for my sweet boy. and for me. I almost chickened out as I was filling out paperwork. Should we just do the tubes and not worry about the adenoids? But then I realized that my decision-making skills may have been a bit inhibited by only 6 hours of sleep and the frappucinos I chugged on the way up. So I went with our previous decision. Thank you to whoever was praying around 6:45 a.m. Clearly, I needed it. We'll be spending the next few hours cuddling. Reading. Letting Burger King make our supper. Sitting. Probably drinking a little more caffeine. And just being together because as my big boy says, "Leaving is my least favorite part." Love you guys! Glad you have this record.